Limited time offer: Support Techdirt and get a "Nerd Harder." t-shirt! When the "going dark" encryption debates kicked off, a very, very long list of technology and encryption experts wrote a letter explaining that designing backdoors for encryption was a monumentally bad idea that inevitably would lead to weaker security and more vulnerabilities that made everyone less safe. In response to this, FBI Director James Comey, twisted what the letter said around to claim that the tech industry was claiming that it was too hard to backdoor encryption. But there's a difference between saying "this is hard" and "this is dangerous." Either way, a bunch of defenders of backdooring encryption started to pick up on this ridiculous framing, leading Julian Sanchez to coin the term "nerd harder!" 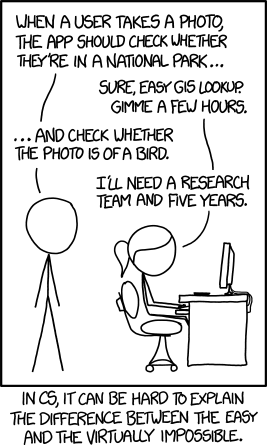 as a way of describing non-technical policy people insisting that techies can just solve some problem if they put their minds to it. Then, last week, at the Copyright Office's DMCA hearings, I noted a similar kind of thinking, around copyright issues. That time, a lobbyist for legacy content companies insisted that if Silicon Valley was able to build a self-driving car, surely they could build a technology that would stop infringing content, without harming fair use. It was Nerd Harder all over again. 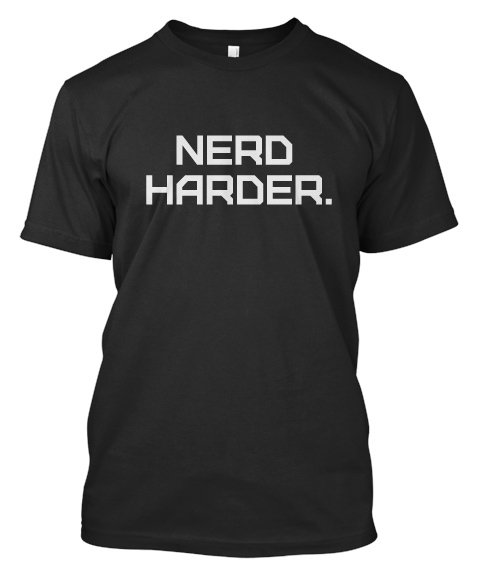 After commenting on that, a few people suggested that Nerd Harder might make a good t-shirt slogan -- and we agree! So we made one. Nerd Harder may be an absolutely terrible policy idea, but it sure does make a nice looking t-shirt. We're doing this as a bit of an experiment, and we're using Teespring to make it work. Teespring is a t-shirt, crowdfunding setup, and we need to have enough people order the shirts in order to actually get them printed. So if we don't get enough orders, no t-shirts. But this also means that the campaign is for a limited time -- just through May 29th -- so put your order in now! Good Grief! I need new glasses. I thought it said Nerd Herder. Re: Good Grief! I need new glasses. Why black?! It's summer Dudes! Summer? Summer?? Real nerds don't EVER go outdoors. Daylight kills precious nerding cells. Don't ever do that! Because white causes screen glare. Summer only exists outside of the lab dude. The period really pulls the shirt together. Wouldn't work without the period. You can figure out how to remove it. NERD HARDER! i'm going to nerd so hard in this shirt i'll violate indecency laws. LOOK HOW HARD MY NERD IS!!! Who at first glance thought this said "Nerf Herder"
Which printing method do you apply on a t-shirt? because I love to wear this type of t-shirt.